In honor of Bedlam basketball tomorrow (and the absolute beat down Sooner Football received last weekend), the word of the day is “schadenfreude“: enjoyment obtained from the troubles of others. This year caused plenty of consternation for Cowboys everywhere. In the coaches’ offices. In the locker room. In the stands. OSU showed it could beat any team on its schedule, which made it all the more difficult when the Cowboys proved equally adept at losing to any team on its schedule. I have the hardest time landing on who this team is – a team capable of gashing a Texas team talented enough to beat Georgia was also capable of being outscored by an offensively-inept TCU team. • SB Nation’s Bill Connelly dove even deeper into the above discussion – how flummoxing this team was in the context of Mike Gundy’s teams. On the other hand, this was Oklahoma State, a program becoming one of the most consistent in college football. The Pokes had lost plenty of stars before and turned out just fine. They had won at least nine games in eight of the previous 10 seasons and had ranked in the S&P+ top 30 in 10 of 12. Was this a reset year like 2014, when OSU fell out of the S&P+ top 80 before a swift rebound? Or was this yet another underestimated, top-15-caliber Cowboys squad? First – stop what you’re doing and go read the piece for a dose of macro-level perspective on Cowboy Football. “One of the most consistent in college football” and “yet another underestimated, top-15 caliber Cowboys squad” are akk-urat descriptors of Cowboy Football over the last dozen years. It’s the top 15-potential with a top 50 record that’s perplexing this year. • Bobby A. floats his take on potential offensive coordinator hires. I could see a co-coordinator situation with Henson and Dunn. Henson would have an edge as he has called plays before, but I have no doubt that Dunn would be more than capable. His stance is that if you don’t hire either one you’ve got to bring in a more experienced guy, so as to not upset the chemistry (a la Joe Wickline). The juicy tidbit was dropping that (per a source) Gundy and Todd Monken had at least talked about the possibility of Monken coming back. • This comment from Mike Boynton on Cam McGriff stuck out. Cam McGriff and his consistency are huge for this team. If he looks like an NBA 3-and-D wing and hits with volume edging up from 13 points per game into the higher teens (16-19), they can get up into the 70’s and have a chance. Those extra points to break the cold spells offensively would go a long way. 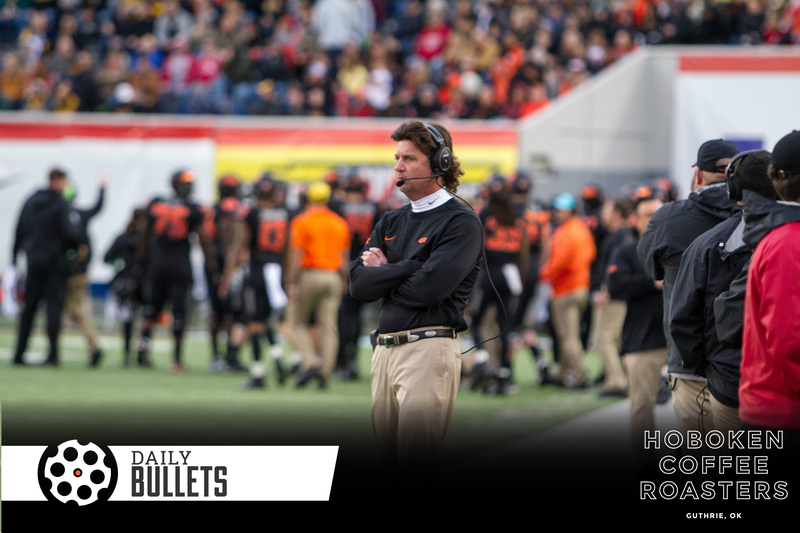 • Porter weighed in on the garden variety of offensive coordinators in Stillwater and slides in his take on Yurcich leaving. When a head coach hires someone to coordinate their side of the ball, there will generally more interference than early season AJ Green. I’m not positive what the defensive culture is in Stillwater but there’s offensive potential flowing from the Arkansas Waterfall. And there’s much less pressure (and importance) to who OSU hires at OC than at DC. • Going behind the curtain of Mike Gundy’s decision-making, here were his recent comments about the process behind hiring Mike Yurcich. “We hit a homer with Mike,” Gundy said. “We went and got him because I felt like if we had gone and gotten a name guy, in two years, he would’ve left again because that is what was happening to us. We bring a guy in, we average 50 points a game and the guy leaves. Gundy has been spotty on some hires ( two of three hires seem to work out) but his OCs have been very successful. I’m pulling for someone he’s not mentoring and respects enough to hand playcalling over to. • Welcome to 2019 – where the idea of joining a group centered around conversation with other people in your physical presence is countercultural. You can count the PFB Tailgate from homecoming as analog social media if you attended. Not quite as cheery but this piece by David Brooks on individualism today was thought-provoking as well. • Thought this was an interesting spin on the definition of a “grudge”.